I'll humbly accept the "Shoot the Moon" award and vow to do better next week! Assuming there are no insane yarn sales. Have a great week! I guess being sick saved me since I didn't get the chance to go through my mom's stash. Would Kayla like to join crochetville so she can post herself and enjoy the rest of the site, too? I put four packages in the mail today, sending yarn and thread that I wouldn't be using off to new homes....+78. Reminder: This is the last week of the month, so please post both your WTD and YTD scores on Saturday. Posting early, unexpected but delightful visit from son & grandson. Pretty sure I won't get anything at all done today. Just building Lego stuff! I'll have to post winners early tomorrow before the stinker wakes up! I was reasonably well-behaved this week...I’ve been working on my socks, and stayed away from the LYS and Michaels. I DID go to our local “KnitFlix” at the Canton Public Library. It’s a fun night where you bring your own dinner, they provide the beverages and snacks, and they play a movie...usually something based on a book. Right now, they’ve been on a Jane Austin kick. People sit and knit and crochet during the movie. They also do a swap. I managed to score a crochet afghan Leisure Arts book “Afghans for all Seasons” from 1993. There are a lot of beautiful afghans! A few look like I might be able to use my stash for them. 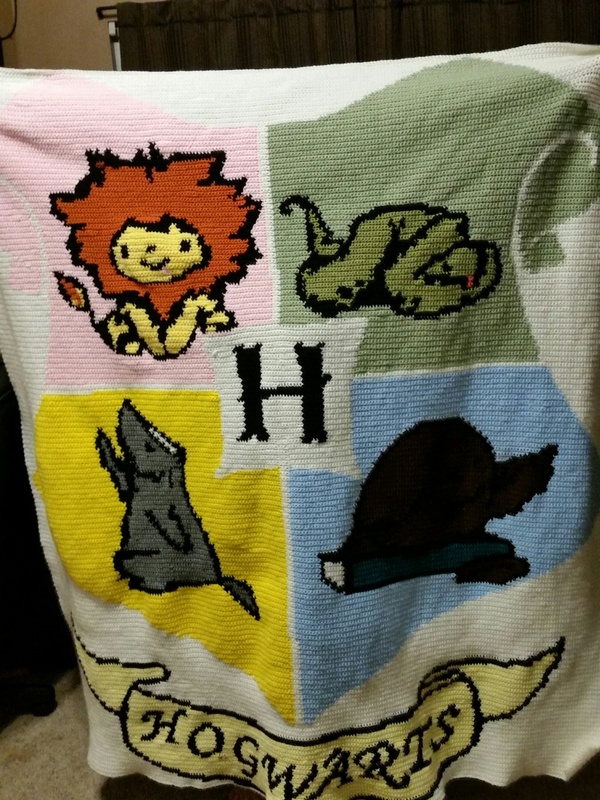 I finished my baby Hogwarts blanket!!! I finished the graph section, at least. I've still got to do a white ruffle border, but the body of the blanket is finished finally!! I used a total of 5 balls and 6 skeins (+17) this week on this project. CONGRATULATIONS! Keep busting that stash! Great looking scores, everyone! It's always good to see a week with no shoot the moon winner! I'll post the scores next week since there was no weekly winner. That sounds like a really fun evening, Pam! The blanket looks great, Jessie! What a lot of work. Sorry I didn't make it in on time! I didn't get much of anything done this week. I added you to the YTD list, Holly. I'd like to join in again this year! Maybe the boards won't mess up on me mid year so I can still post stuff! Anyways, looks like I'm beginning this years stashbusting CAL with a -6, because I had a request to make an afghan for my cousin's wifes niece. LOL. 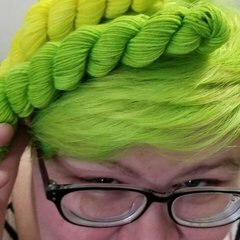 I finished two projects today and used up one skein and rolled another into a ball....+3 = +4. I got the two skeins for two scarves requested by my best friend's DIL yesterday, so I've cancelled out my positives for the week.